Keys to the Magic Travel: Brave Highland Games tournament at Epcot - and a giveaway! 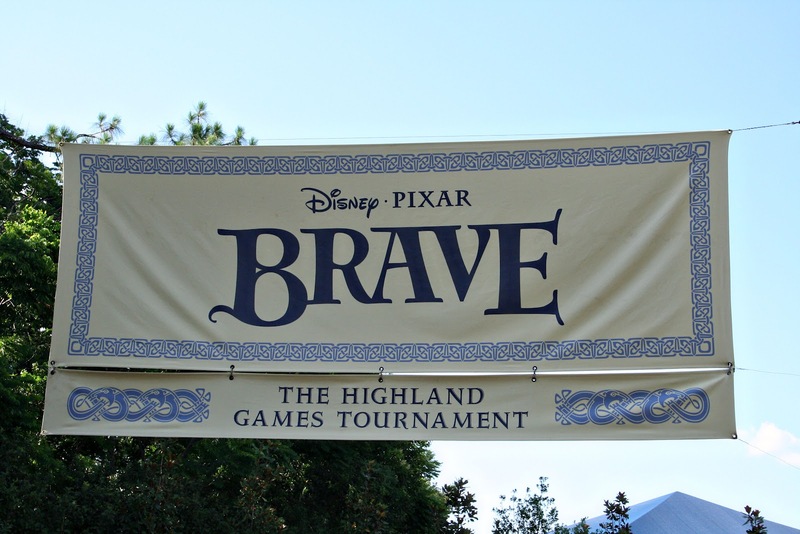 Brave Highland Games tournament at Epcot - and a giveaway! Welcome to day three of our "Brave" celebration! If you missed it, on Monday we looked at the Brave sand sculpture and yesterday we met Merida. 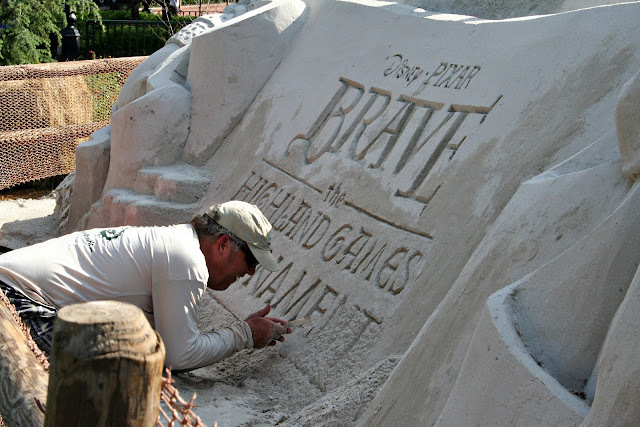 Today we are upping the anticipation for the movie by talking about the Highland games - and keep reading because there is a giveaway, too! Now through July 8th, if you go to Epcot, be sure to check out the Highland Games. When you arrive, you'll spin the wheel to see which clan you'll represent in the games. You'll then be given a button to loudly proclaim your family ties. My older daughter just wanted the button! First up in the games is archery. 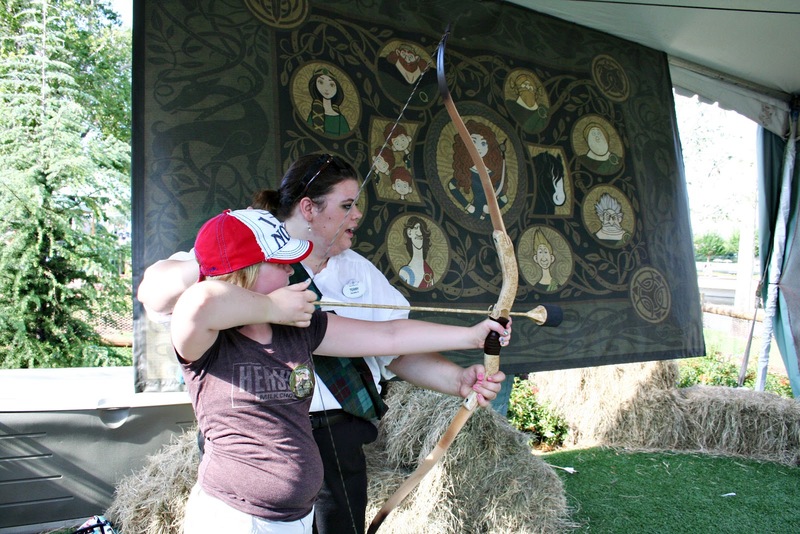 It's pretty much the same set up as the archery in the Merida meet and greet. Then we have the cake toss. The cake looks remarkably similar to the haggis. Though I assure you that there really and truly is no confusion between haggis and cake. 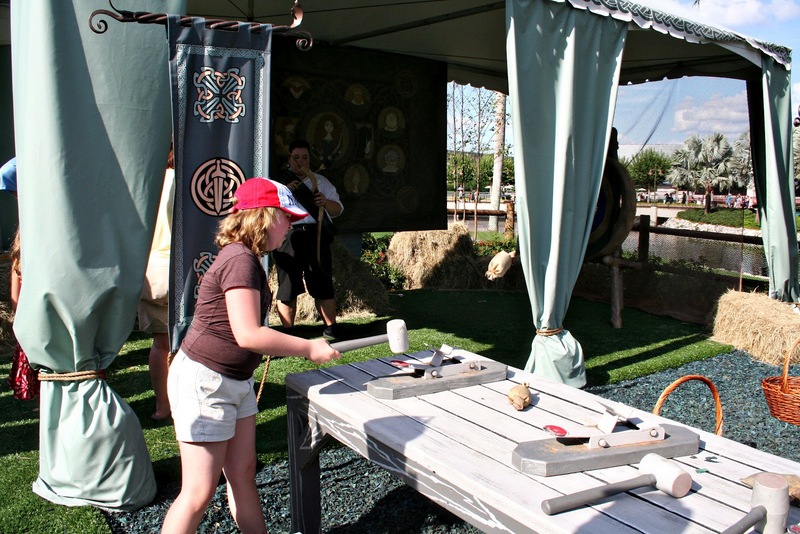 And this game looks remarkably similar to a game we call corn hole. But. Anyway. The goal is to toss the cake into the holes. And finally there is the mini-caber toss. 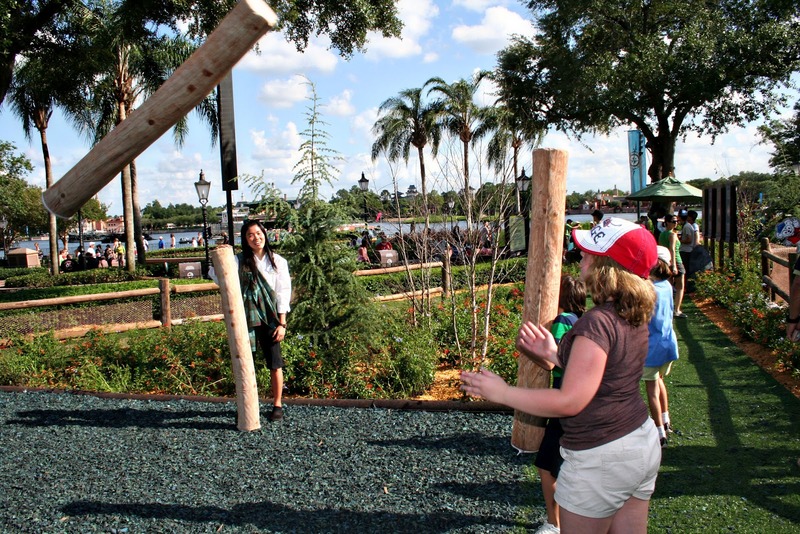 Which having actually been to a Highland games festival - actually looks like a caber toss. You stand up your caber and then. Well. You toss. And great fun is had by all. 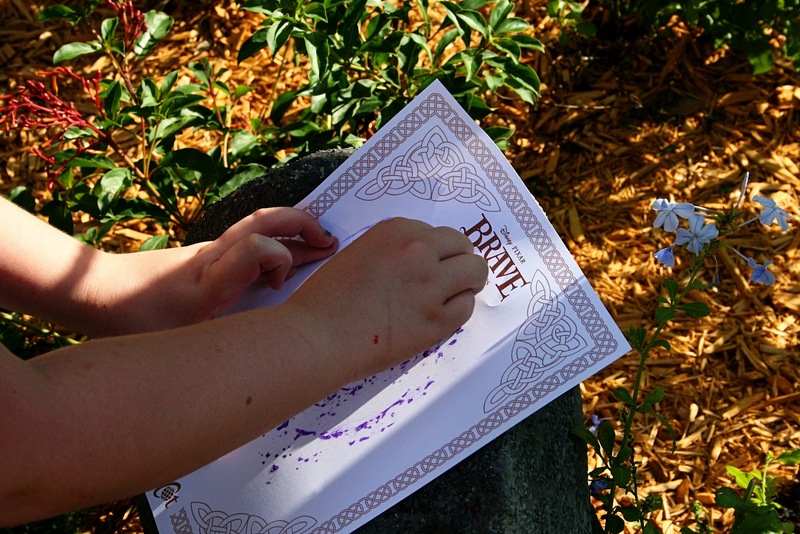 Finally, when you are done with the games, you can do a rubbing of your family "emblem." Just an FYI - these games take place in the direct sun and there is not a spot of shade to be found! Okay. Now who wants a giveaway?! 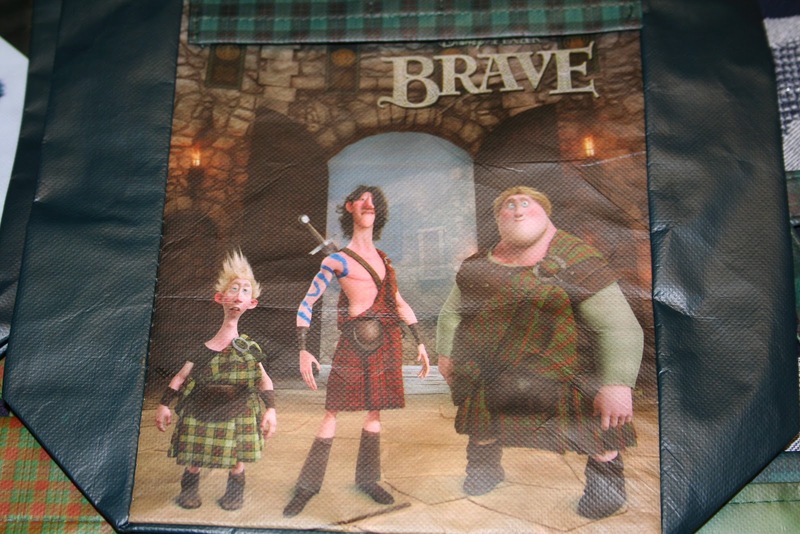 So, last week I heard that Subway is giving away Brave lunch bags with each kids meal - and I knew that we needed these bags. (Yes. I said needed.) And not only did I need all six of them. But I knew that one of my readers needed them too. So I have a complete set of all six bags just for you! Aren't they great? They are folded flat, but they do open and have a flat bottom with a velcro closure. To enter, just follow the entries on the rafflecopter below - and if you have trouble with any of it, please just email me at disneykatrina@gmail.com and we'll get it figured out! So...what about you? Which Highland game looks fun to you? 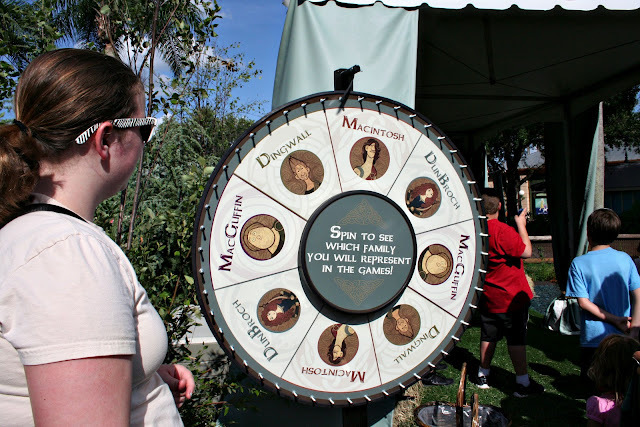 Have you ever been to a Highland games?? If you want to see more Disney photos - please be sure to check out Deb's website: Focused on the Magic! 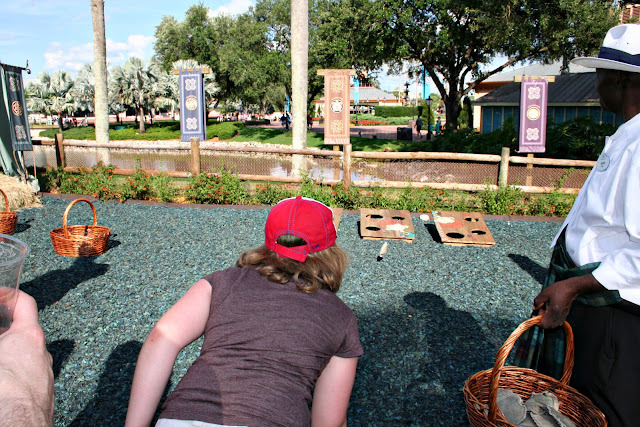 Great shots, my family loved playing these games and collecting the buttons. Thanks for offering up a giveaway as well! 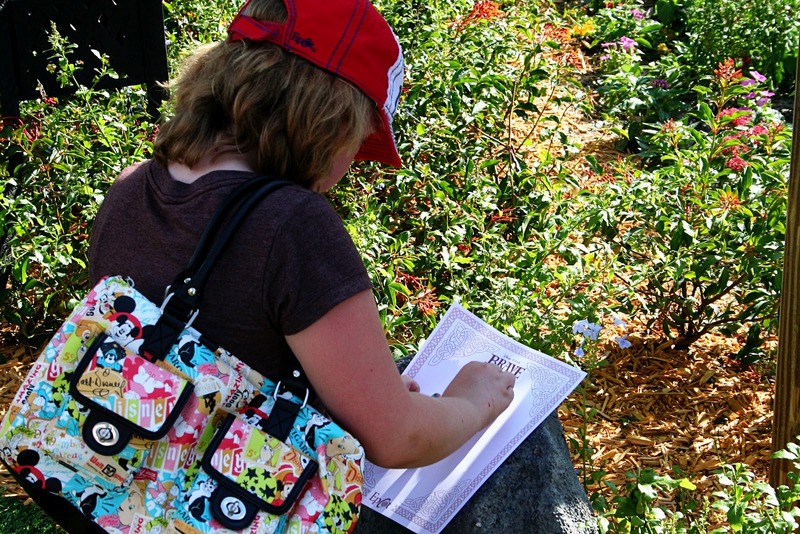 We were looking forward to checking this out, but because it was raining the day we were at Epcot, they were closed! Too bad. Thanks for the pix and info! What a wonderful day you had at the highland games! Great giveaway! That looks like so much fun! My daughter is impatiently waiting to see this movie - it's been quite a while since we have been so excited about a movie release! 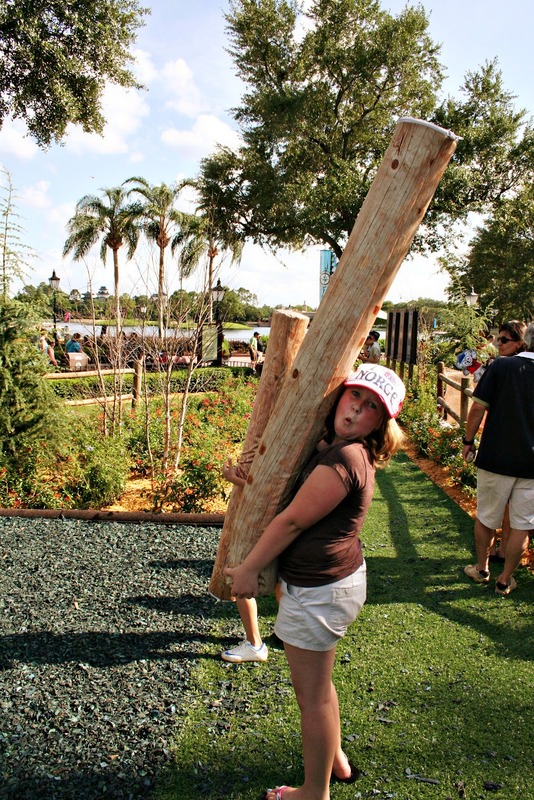 Love the photo of your daughter with the "mini-caber"! My daughter would so love this. And she would love those bags! Hooray for great minds ;) I love seeing the actual action photos from the Highland Games; thank you!! Great post this week! I'm bummed we won't be able to catch the Highland Games - it looks so fun, but we don't have a WDW trip scheduled this year :( Thanks for letting me live vicariously through your pictures :) I also really like the Disneyland purse your daughter is carrying - I have the same one! 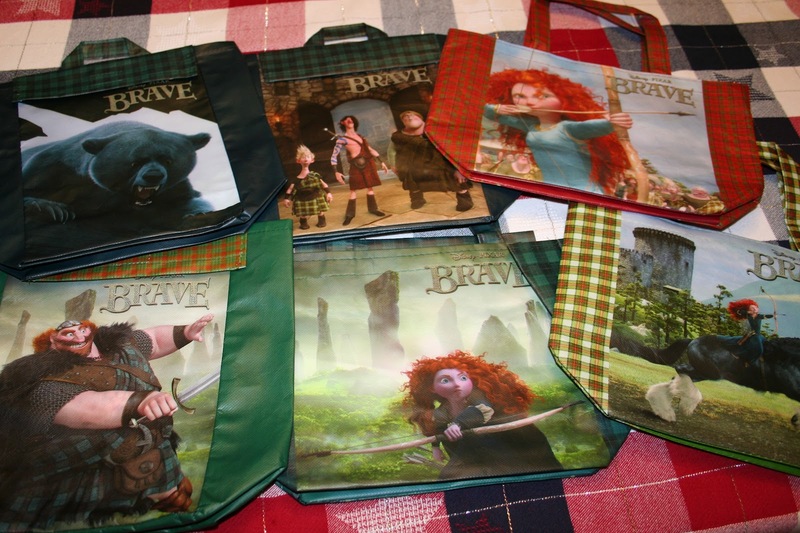 Great giveaway too - those are neat bags that I'm sure my daughter would LOVE to have! Oh fun! What great shots!! I'm guessing the mini-caber toss isn't quite as dangerous as it looks? I can envision all sorts of things going wrong with that one (and don't get me started on the haggis!). That looked like fun, BTW I love the purse! I have never seen Highland Games. 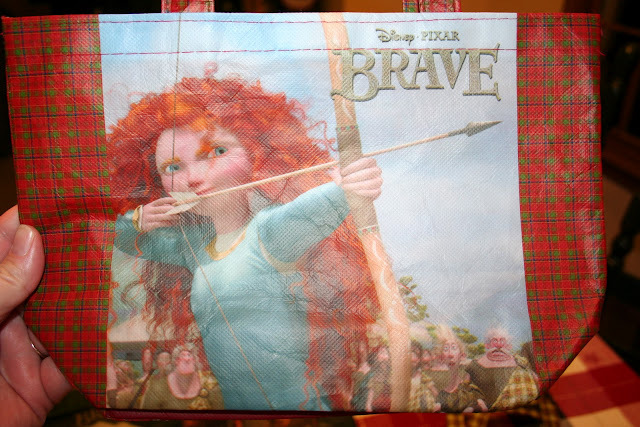 And I can't wait until Brave!! I'm sad because I can't see the pix in this post... :( Think I'm having firewall issues. Thanks for the giveaway! You know I need me some plaid. I've tried entering twice from work and it locked up on me. Then again, considering where I work that's not out of the ordinary. How fun! We're hoping to see Brave for Rachel's 18th birthday next week! Sounds so much fun! 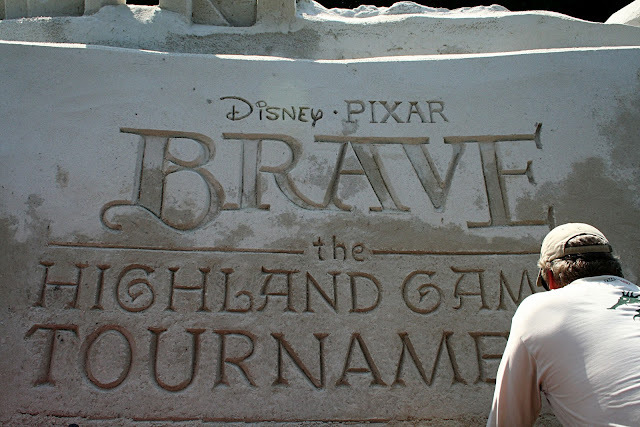 I love the sand sculpture. Wish I had the patience for that kind of artwork.